This page contains information and links for Online Contributions and Corporate Matching Gifts. You can use your PayPal account or credit card number to make secure online payments to the Chabot PTA via PayPal.com. All donations are tax-deductible as allowed by the Internal Revenue Service (Tax ID #94-6171779). 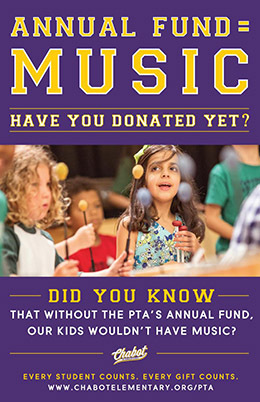 Contributions to the Chabot PTA Annual Fund may be made as a single payment of any amount, or in seven monthly installments. Click either of the payment options below to open a PayPal Web form where you can complete your transaction. A receipt will be emailed to you upon submission of each contribution. If you prefer to make your contribution by check or offline credit card payment, please contact the Annual Fund Co-Chairs Deb Kong, Meghan Horl, and Greg Kato at annualfund@chabotelementary.org. Use this button to make a one-time contribution of any amount to the Chabot PTA (PayPal account not required). Suggested donation is $950 per child. Use this button to setup a contribution in seven monthly payments. 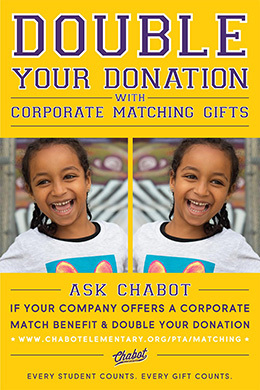 You can double or triple your contribution to the Chabot PTA by taking advantage of your corporate match benefit.Many companies, both large and small, will match donations made by their employees. Some companies even match gifts made by retirees, family members, and friends of Chabot PTA! Your contributions fund important programs and services including art, science, technology, music, Spanish, library and more.